This week I sat down with Beth Ventura, Founder of pocket, a digital marketing company, and Allan Conner, Founder of My Professional CFO. If your business is trying to get the word out about your brand and have the greatest ROI for your spend, you should educate yourself about digital marketing. As the pocket team says, “To gain new customers, you only have a moment to attract their attention. Tablets, mobile, social, email are all the tools in the palm of their hands in which you must reach and resonate, quickly. You just have a moment. Are you in their pocket? We are pocket. We are a team of experienced digital and traditional marketers with years of success. Alan Conner is a certified wealth advisor and a public accountant and co-founder of My Professional CFO and NovaPoint Capital. His firm provides fractional CFO services for small- to mid-sized businesses, including my own. Alan and his partner, Joseph Sroka, are able to handle the financial needs of a business to maximize retained revenue through effective and legal tax strategy as well as through wealth management services. This week hosts Emma Foulkes and Bruce Logue of AGLCC featured three experts from the real estate industry who facilitate home sales/purchases. Realtor with Keller Williams, Chip Ivey, joined us to talk about the Atlanta home market and shared some tips for buyers to think about. Fifth Third Bank provides mortgage origination services as part of their suite of solutions provided to their customers. Lori Gehring and Kevin Walts came by to talk about the mortgage process and gave some insight on what to look out for and how to best prepare for securing a mortgage. Housing Authority, ANDPI, Lawrenceville Housing Authority, DeKalb County DPA . 5/3 is also actively involved with the Urban League and RRC doing Empower U classes- including Mortgage Classes. Lesley Robertson is an attorney with Shafritz & Dean LLC, specializing in real estate law in Atlanta since 1998. She has closed large deals in both residential and commercial developments, working with the gamut of professionals and individuals with real estate needs. Shafritz & Dean is a firm specializing in expertise in real estate in Georgia and Florida, estate planning, and corporate law. The practice prides itself in what it describes as “Silver Lining Service” for each individual they encounter, in an effort to insure that everyone walks away happy. This week Amy Selby and I sat down with Barbara Hickey of Etiquette School of Atlanta and Ed Zito of American Kidney Services. We talked about the upcoming Cobb County Chamber of Commerce’s Business Expo and Summer JAM, held May 4 at Cobb Galleria Centre. Over 1000 attendees are expected at this year’s event; it’s a great opportunity for area businesses to be seen and meet potential clients. Barbara shared how her business helps executives and individuals improve their communication skills and their ability to make a good impression while building rapport through her etiquette training services. She also helps bring the Business Expo with Summer JAM together each year through her work with the Coalition of Cobb County Business Associations. Ed Zito came by to talk about how American Kidney Services supports individuals with limited resources who are dealing with renal disease requiring dialysis and other care but would not otherwise be able to access treatment they need. American Kidney Services is well-known for their blue trucks and collection sites where community residents can donate items that will be re-sold to raise money for the charity. Ed explained clothing is one of the primary items they look for as a donated item but they can use functional furniture, appliances, and other items that can be re-sold. Their pick-up services are free and the drivers will issue a tax receipt that allows donors to be able to effectively claim their items on their tax returns. 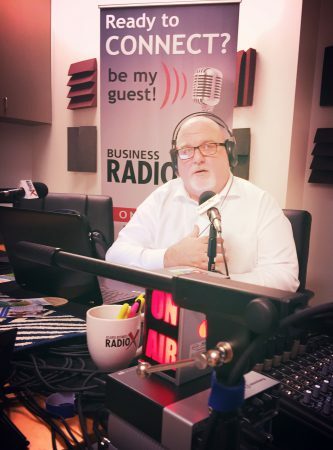 Transformational marketing firm, TopRight Partners, CEO Dave Sutton, sits in with CW Hall to host client and friend, Dan Campbell, founder of Hire Dynamics. We talked about how Dan drew from his experiences in previous companies where the work relationships and culture often muted productivity and morale when he decided to place emphasis on creating a work environment designed to promote employee buy-in. Dan commented on the irony of the fact that many staffing companies, who’s business is placing good people in good jobs as a service, often do a very poor job at creating a culture where the employees who are responsible for finding and filling jobs feel valued. With a background in healthcare staffing of over 15 years, CW readily agreed, having experienced both good and bad work environments himself. Hire Dynamics saw the opportunity to differentiate themselves from the competition through their focus on positive company culture and making employees feel valuable. This translated into client and candidate relationships that frequently led to referred business. The company’s fast, steady growth resulted in the recent acquisition by MSouth Equity Partners, an Atlanta based equity firm that typically invests in businesses from $25MM-100MM in revenues. counties in Georgia and Tennessee. events such as Iron Man, Mud Runs and Triathlons. serves both Kennesaw State students and members of the surrounding community as a state of the art recreation facility. Kennesaw State soccer, lacrosse and football as well as the Atlanta Blaze professional men’s lacrosse team are all housed in Fifth Third Bank Stadium which is the main venue in the sports park. The park is also the home of the student-run company Night Owl Productions which grants KSU students hands-on professional experience in the event operations world. Management, * Travel &amp; Event Management Clients: * Georgia House Democratic Caucus, Democratic Party of Georgia &amp; House Minority Leader Stacey Abrams, * GeorgiaNext, Inc., * Grady Health System, * The LMB Group, LLC, * Upfront Megatainment Special Projects &amp; Non-Profit Organizations: * Atlanta Pride Committee, * State Committee, Democratic Party of Georgia, * Georgia Equality, * Victory Fund, * Atlanta Gay Lesbian Chamber of Commerce. tours, and packages. AAA members receive benefits that you can receive no where else, including personalized service, travel advice, and more. Hector Lopez is a recently-joined new Allied member of AGLCC, and founder of Lopez Construction Inc. A long-time expert in real estate, Hector saw an opportunity to meet the needs of his clients to renovate their properties. In 1990, he apprenticed under 2 master builders, learning the in’s and out’s of the business of being a general contractor over several years, ultimately starting his own company in 1997.